...to see the one of many applied biometrics. In fact, the way it determines if an insect is nearby, it could almost be called, Insect Recognition. Venus flytrap - leader in biometrics? The conference sessions held at CSI's annual conference back in November are available online. You can view them free after registering. 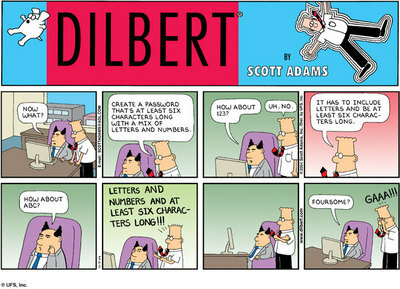 They're all about information security. Whether any of the speakers brush on biometrics, I'm not too sure about. Somebody's weblog posted this image from a reader that shows the 'US is down'. 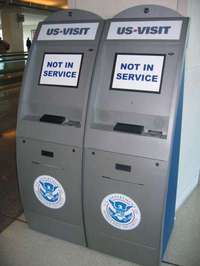 We should know by now that these kiosks are just one way of going through the US-VISIT process; most locations focus more on the manned booths. But this would be a whole lot funnier if say, it was real. So I guess - here's to a good laugh at photoshopping. US Closed for the day. Identifying a biometric goes on a gazillion times a day. Only now do we have technology to do the dirty work for us, and make assumptions based more on fact than objective human opinions. But anytime someone identifies a person by looking at particular characteristics of theirs, that's using a biometric. Even though there is no database for any biometric system to compare victims of the Tsunami to, there is still biometric identification going on. They are narrowing down identification of the bodies by determining foreigners from natives by measuring the length of bones, facial bone structure, and patterns of hair growth. Sometimes you just have to take a step back and take 'biometrics' for what it really is: A measurable, physical characteristic or personal behavioral trait used to recognize the identity, or verify the claimed identity, of an enrollee. In this case, let's just say they are an 'enrollee' of the human race. Good luck to those doctors, they have a long arduous task ahead of them. Thais to restart identifying tsunami victims. How easy it is to work for Apple.. for free. Okay we're back. Did you keep yourself entertained during the holidays? Even though we weren't helping to spread the word, there was still news being created, and some of it deserves our special attention. I personally believe there aren't enough humorous biometric blogs around, so I thought I'd go first. Really, who said you can't have humor while talking about security? Okay yeah, airport security sure, but name another one!! Instruct airport screeners to hit everyone in the nuts. Find a replacement for Tom Ridge that's even Ridgier. Institute a 'books for bombs' program. Make border crossing employees intimidating locked-out NHL players. Anyone who phones in a tip about a terrorist plot gets a free Sirius satellite radio. All foreign visitors to be outfitted with LoJack system. Maybe some area rugs and throw pillows? Get on Osama's good side by sending him a Christmas fruit basket by Harry & David. Come up with a cool catch phrase like 'you're fired!'. Instead of colors, assign each threat level a different flavor of Pringles. Awaiting consent of the Senate is President Bush's nomination for replacement of Tom Ridge. That would be former New York City police commisioner Bernard Kerik. He has been a part of the efforts relating to 9/11 and terrorism since well, 9/11, so this should be nothing new to him. Bush nominates Kerik for Homeland Security. It's been in the news since a few weeks ago, but now it's official. Tom Ridge has resigned from his position as Secretary of Homeland Security. Ridge, 59, told colleagues he was tired and needed to earn more money for his two children's college educations, the Associated Press reported July 30. His salary is $175,000. Where are they going to school? InSanelyExpensiveTakeAllYourMoneyAndRun University? I know it's expensive to go to school, but there are so many people that have more than one child in college and are doing it with way less annual income. Sounds like just an excuse to me. He was probably just tired of being responsible for protecting millions of people from a single terrorist attack. That, and the color orange.